Based on the idea of Pygmy Puffs, in the Harry Potter series. Make sure you choose eyes to complement your wool, these mauve dolls' eyes look gorgeous with the pale blue 'fur'. Yep, it's just how I pictured them, too! I haven't been game to try this Kitty, because the fluffy-ness is really daunting. this is the cutes thing i have ever seen in my life. Oops! Thanks for letting me know, Luciana. 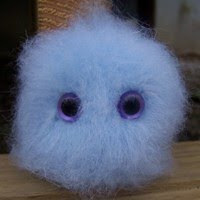 hey..your pygmy puffs totally damn cute..but the link is broken..i really want to make one..